In Jaws, the mayor tries to play down the shark attacks because he’s afraid it will scare away the tourists. 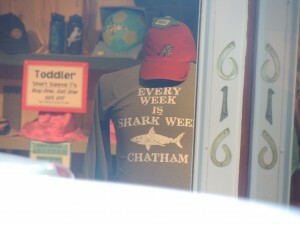 In the Cape Cod town of Chatham, MA, however, it’s the shark paraphenilia that tourists want. In July a great white shark bit a body surfer on a sandbar off Truro’s Ballston Beach. The 50-year-old fought back by kicking the shark and ended up with 47 stitches. Obviously, the t-shirts wouldn’t be as fun if the shark had attacked a little kid instead of a guy who seems like a really competent athlete. But as long as nobody gets killed, it’s totally fine to sell silly shirts. Greg Skomal, a state marine biologist with the state Division of Marine Fisheries told CBS this was the first shark attack in MA since 1936. The sharks are coming to eat seals, which have shown up in bigger numbers since seal hunting became much less popular, even in Canada, and fishermen aren’t allowed to just shoot them as potential competitors. 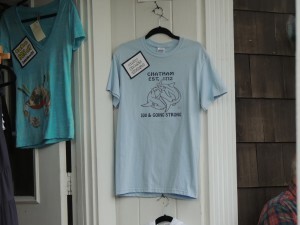 You could potentially see seals (and the sharks who want to eat them) anywhere along Cape Cod, but if you really want to watch them, you head to Chatham, an adorable little town on the elbow of the cape, where seals come in increasing to lounge on Monomoy Island. During the summer and some of the fall, you can try a boat tours. They’re generally kind of expensive and not dog friendly. Blue Claw has several fall and summer options from Orleans, generally $50 for adults and $45 for kids. Monomoy Island Ferry has cruises ($35, $30) from Chatham and even a day trip that lets you walk on Monomoy Island. (It’s run as a charter, so you’ll be paying $360 for up to 6 people). Monomoy Island Outfitters does charters. Beachcomber ($29,$25) has you take a trolley from North Chatham to a 90 minute seal cruise. Chatham Water Tours leaves from Chatham’s Fish Pier and charges only $20, $15 for kids. Or just take a ferry to Nantucket ($77, $51) You may be able to see seals along the way and in the harbor on the other side. Option 2–See them from the shore–faster, cheaper, less annoying to the seals–but less reliable or satisfying. Look for seals anywhere boats come in. One fisherman told me to check around low tide or (for seals hoping to mooch off boats) late afternoon. The most popular land-based spot to see them is Chatham town beach. I saw several seals on the offshore sandbars. But the most successful spot may be the Chatham Fishing Pier, off Shore Road by Tern Island Sanctuary. You can check the webcam to see what’s going on, but most of the action is in late afternoon when the boats come in. For that matter, nearly any harbor will get seals around four in the afternoon, too. People see them by the Cape Cod Canal in Sandwich, for example. And then, just pretty much any beach, especially around the elbow of the Cape. I saw seals in the water at the Truro Lighthouse, even though it’s on the other side of the Cape from Chatham. People see them up on the beach, there, too, or on the sandbars. (This is where the shark attack was, remember.) Nauset Beach in Orleans gets seal visitors, too.